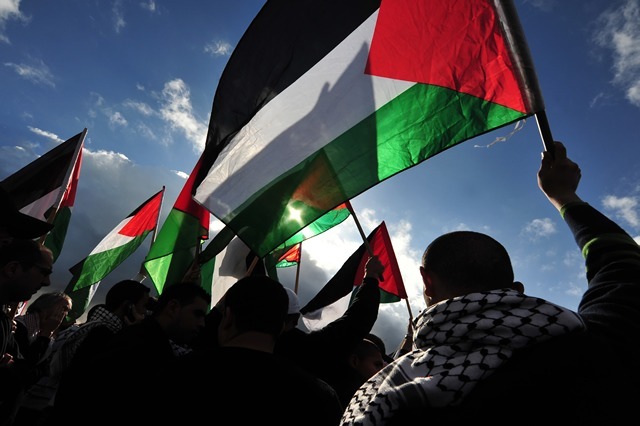 IHRC is calling on you to fly a Palestinian flag outside your house or display a Palestinian flag in your window, on your car or on the walls of your shop. With mainstream media coverage being unbalanced or non-existant, take a public and visible stance in support of the Palestinians. You can download a flag from here or scroll down below. Print the flag out and make sure it is on display so that your support is visible and those who want to pretend will know that you cannot simply be brushed aside. If you’d prefer to buy a cloth flag instead, you can do so from HERE or HERE. TWEET ABOUT THE CAMPAIGN! Once you’ve put your flag up, take a picture and send it to us @IHRC using the hashtag #FlyAFlag. Tell others to take up the cause by using the hashtag #FlyAFlag and linking to this page. Tweet your President or Prime Minister with the updated list of the dead everyday. You can find a list naming the dead HERE. If you ensure that you send a tweet at least once a day, it is a constant reminder of the innocent lives lost. The more people who take part in this action, the better. It won’t take any effort on your part but if we have a group of people constantly tweeting, it will be like a barage that has to be noticed. Please tweet the link to your country’s leader on a daily basis so this onslaught does not go unnoticed. Join the annual Al-Quds Day demonstration on Friday 25 July in the UK. The march starts at the BBC on Duchess Street and culminates in a a rally at the US Embassy. Click here if you’d like more information. Click HERE for information on where other cities across the world are hosting their own demonstrations as well as other protests that will be taking place. Share your art and poetry through social media – in whatever way you feel you can best help. Tweet us @IHRC with your poetry and artwork!